The weather around here is very variable. A few weeks ago, we had one or two warm days, and I had spring fever. I saw a bush that looked like it had been blown down in a storm. I tugged gently on one of its twigs to see whether it was alive, and it was. I tugged a little harder, broke off a small piece of the twig, brought it home, put it in an old spice jar with water, and watched it. The buds on the twig opened gradually, and I photographed the tiny green leaves coming out for a few weeks. At about the same time, I bought some potted tulips on sale at the grocery store. The woman who worked in the plant department told me that the tulips were pot-bound and suggested that I put them in a larger pot. That’s what I did. I love gardening, but I don’t live in a house with a yard any more, so I keep a few potted plants on my balcony. I went out on the balcony and removed the tulips from their pot. The woman at the grocery store was right. The tulips roots were tightly coiled, so I separated them and repotted the plant. As always, I felt so happy when I put my hands in the dirt that I started singing. Someone once told me that when I do this, I’m touching God. After my experiences with the twig and the tulips, we had more cold weather. Then, a few days ago, the weather got warm and sunny again. In fact, it got unseasonably warm. Today the temperature went up to 83 degrees F, about two months ahead of schedule. I took my new camera with all three lenses and went to a public garden near my home. The sunlight was bright and diffused by clouds, and there was no wind – great conditions for taking close-up photographs of flowers. After a while, the sky became more overcast and a gentle breeze sprung up. The gentle breeze was like a tempest on the small flowers. The conditions were not so good for photography, but I felt happy and kept taking photos anyway. One advantage of my digital SLR camera is that I can take many shots without wasting money. I even took some photos of the little signs on the ground which gave the plants’ names. 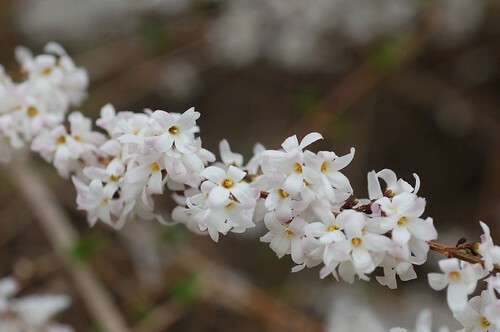 I saw some wondrous flowers, including some common ones (several kinds of daffodils and pansies) and some that I had never seen before (white forsythia, a very unusual Korean rhododendron, and Chinese winter hazel). Late in the afternoon, I saw a group of girls and a woman sitting on a blanket. As I watched, the women stood up and used a “magic wand” to blow bubbles. Wondrous bubbles they were – large and strong. (They reminded me of something I had synthesized in organic chem lab long ago.) 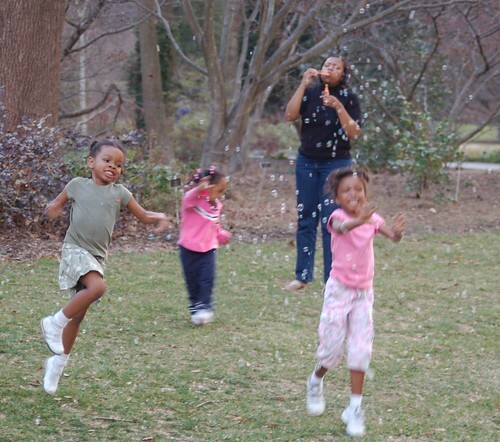 The four little girls ran after the bubbles, screaming with delight when they caught one. Some of the bubbles landed on me, and I talked with the girls about them. I photographed the girls chasing the bubbles. The woman called the girls, and they started packing up to go home. I went over to her and started a conversation. The four girls ranged in age from four to nine, and two of them were her daughters. She told me that the weather was so nice that she had brought the kids out for a “homework picnic.” I asked her whether they had really done their homework, and she assured me that they had. The Japanese cherry tree outside my window is starting to bloom. A red maple nearby is in full bloom. It looks so pretty and causes me so much trouble (allergies and asthma). Tonight we had a thunderstorm, and cooler weather is on the way. The prediction is for the temperature to dip below freezing later this week. I don’t care. I had fun while I could. I just hope the flowers survive.